December 5th. – December 8th. Lakota Chief- Leonard Crowdog, Jr.
Panel discussion with select visiting artists! FIU Professor Constantino Manuel Torres & other invited guests. Saturday, December 8th, 8pm – Moksha Art Fair multimedia experience. 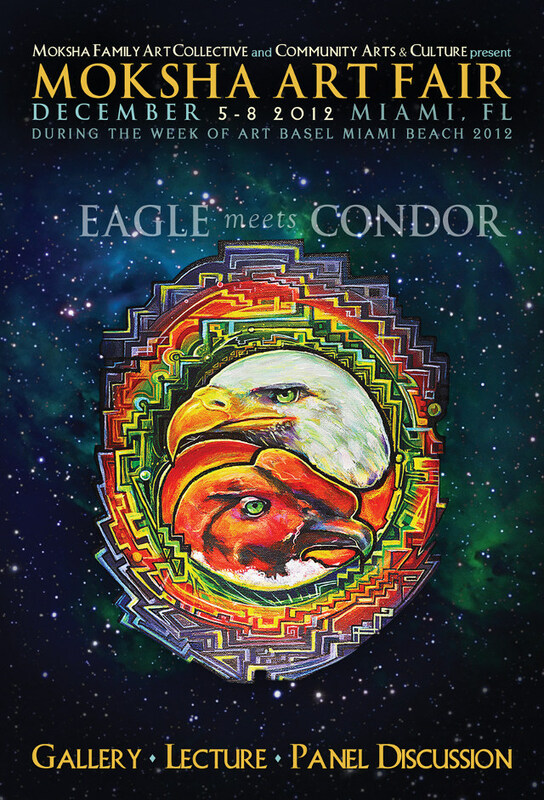 The Moksha Family Artist Collective and Community Arts & Culture present the 2012 Moksha Art Fair with the theme “The Eagle Meets The Condor”, during Art Basel Miami Beach. This showcase works to highlight the cultural and creative connections between the indigenous people of South & Central America with North American shamanism. By utilizing artistic sensibilities to reflect the deep appreciation for ancient knowledge, the Moksha Art Fair brings people together to share and experience art that transcends time. The theme of “The Eagle Meets The Condor” represents a convergence of creativity and reverence of native culture and modern awakening. Part of this international gathering will include shamans, spiritual leaders from South America, Central America and North America who will present traditional elements of their cultural history through artistic displays, educational presentations and interactive demonstrations. This is an opportunity to experience a cultural relevance of history as it meshes in today’s modern world. Within many indigenous cultures there is a 2000 year old prophecy about the eagle meeting the condor to create peace and balance for the people of the Americas. In Andean culture, the prophecy predicted the conflict throughout the Americas from around 1500 to 2000. The eagle represents the modern, technological world while the condor represents the people who live close to the land and honor spirituality and wisdom. As part of the prophecy, it is foretold that we are in a time of transition that will bring the eagle and condor to fly together in harmony. This will require that the people of the Americas embrace a change in consciousness as well as in practices. This partnership will be born of love and healing that will work to undo the conflict through sustainability and understanding. 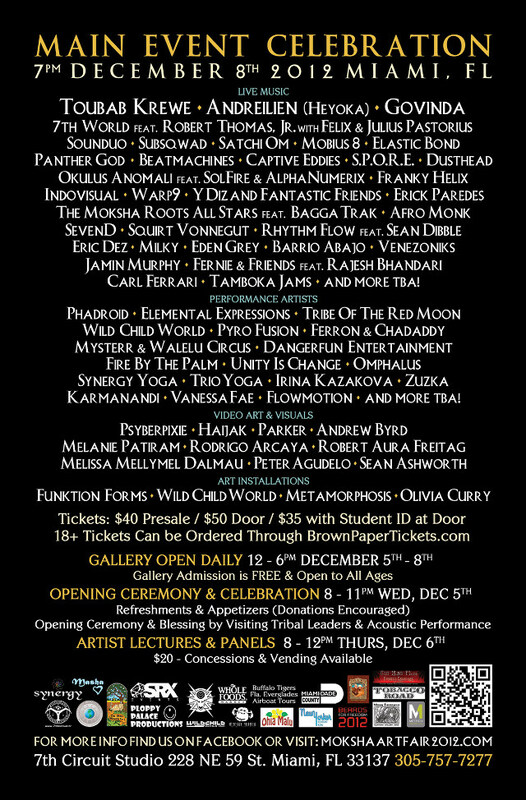 The 2012 Moksha Art Fair honors this prophecy and provides a platform for our visionary community to come together with global awareness, creative interaction and solidarity for holistic wisdom. By merging the modern technology with the roots of nature, we strive to achieve a sense of harmony that can radiate beyond our local community to all across the Earth. As part of the 2012 Moksha Art Fair, there will be a special showcase of international and local artists along with a panel discussion about the cultural impact of enthogens in art. In addition, there will be a special indigenous blessing ceremony that will bring together a selection of tribal cultures. As a culmination of this art festival, there will be multi-media presentation of music, live art and various performances. 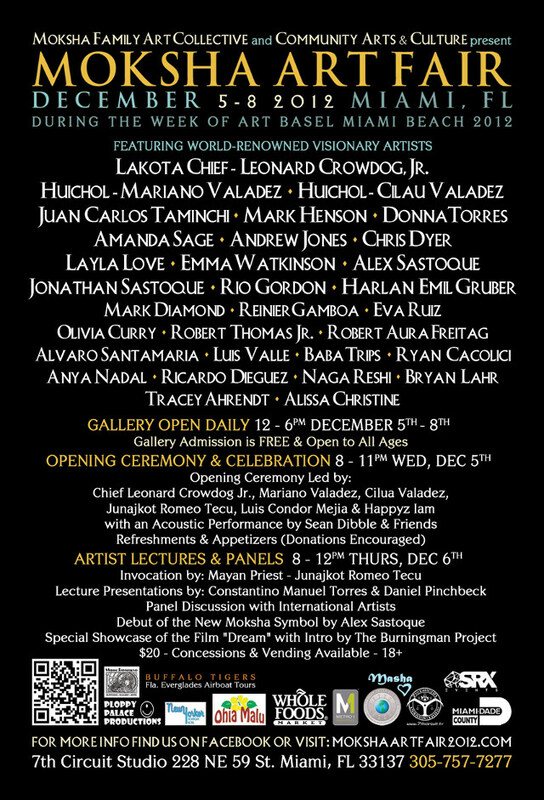 The Moksha Art Fair is the premiere event for visionary art during Art Basel Miami Beach! 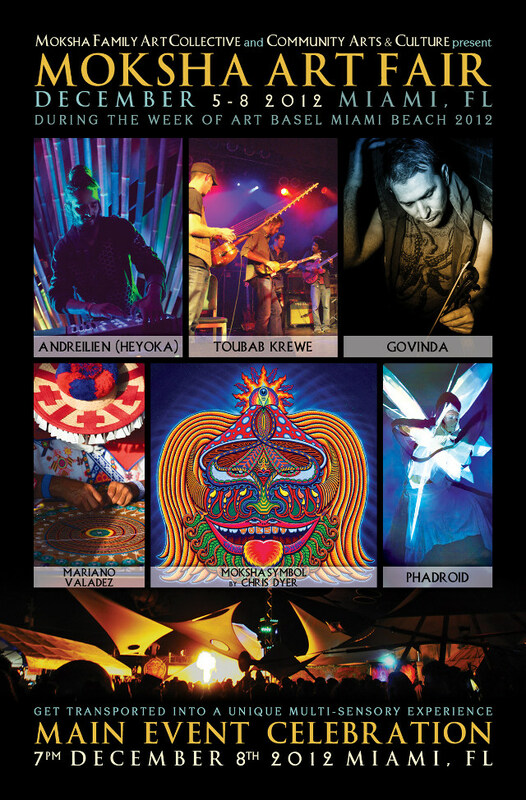 In 2012, The Eagle Meets The Condor will bring together a dynamic selection of artists, performers & musicians! This is a showcase that should not be missed! Make your plans to be at the 2012 Moksha Art Fair! You will be happy you did! Spread the word & be part of something beautiful! Gallery, lecture, music and performance updates coming soon! If you are interested in becoming a sponsor or participating, contact us here or at 305-757-7277.
the Office of the Mayor, and the Board of County Commissioners. We thank you for supporting the movement and keeping the vision alive.